“…Our church is constantly a church that is dreaming and asking, ‘What if?’ when it comes to reaching people for Jesus, so because of that, we are constantly running. We are a church that is on the go, on the move. The life God’s calling us to, it’s not a casual, go-at-your-own-pace slow walk. What God’s doing is exciting, and we want to be a part of that; we want to follow that…”. New worship bands and movements tend to be the ‘fashionable thing’ nowadays, with plenty of upcoming churches recording and releasing albums for the world to listen to. From Desperation Band, Hillsong and Planetshakers to Bethel Music, Jesus Culture, Vertical Church Band and the annual Passion Conferences, there are plenty of avenues to listen to worship, in its pop/radio format and also in its raw, untethered, personal and vulnerable incarnations. So just when you may have thought that worship music couldn’t be any more crowded, Fellowship Creative come on the scene. Born out from Fellowship Church, which was founded in 1990 by Pastor Ed Young, the worship part of the ministry has always been revolving, with this label debut album on Fair Trade Services showcasing many young and up and coming artists’ song writing and vocal talents, while also pointing people to God and His love. As Fellowship Creative promote diversity in age, ethnicity, skill level, Biblical knowledge and many more, the result on the record are sounds that transcend many different styles, with plenty of rockers, ballads, both female and male fronted tracks as well as each track bringing something new and fresh to the table. As there are 15 tracks here with all different styles and vocalists, this in-depth and moving hour long journey is sure to please many and tug at all of our heart strings. Opening the album with the passionate and vibrant “Glory In The Highest”, which is a cool throwback to Audio Adrenaline and specifically Mark Stuart vocally, we are met with a heartfelt anthem about worshipping our king, with true emotion and a heart devoted to God. As the chorus simply yet full of assurance speaks out ‘…glory, glory, glory in the highest, highest, my heart and soul will sing, shout out with everything, glory in the highest…’ amongst the eclectic and frenetic electric guitars and synth, my toes can’t stop dancing, and also my lips can’t stop moving and singing the unending truths of Jesus as well. 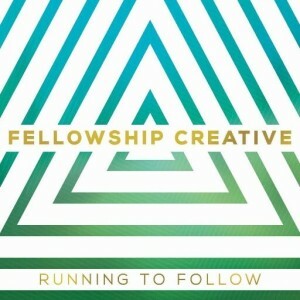 Basically proclaiming the gospel in the verses, Fellowship Creative have come out of the blocks hard and early, with a track that praises Jesus for who He is, and sets the tone for the rest of the album, which is just as strong as the catchy and lyrically powerful and poignant album opener! Throughout the rest of the album, I am in awe again and again at the musical creativity and variety yet also at the seamlessness and ease of transition between these radically musically different yet thematically similar tracks. The title track, though musically sounding a mesh between pop and rock, like an 80’s or 90’s themed musical time warp, with electronics across stirring electric guitar, speaks about us running to follow Jesus, leaving everything behind like the disciples did, all for Jesus and the sake of the Kingdom. Groovy and danceable, what is great here is that the band never waver in their faith, and even without the words of ‘Jesus’ or ‘God’ in the song, their strong faith is evident and on display. Continuing on the theme of vertical worship, “Always Been About You”, a piano pop number and a potential single, stresses the importance of putting the spotlight and emphasis on Jesus rather than ourselves. With hand claps, a bouncy rhythm, emphatic acoustic guitar strums and places for us to sing along that ‘…it’s always been about love…grace…hope…faith…peace…truth, everything that’s always been before it’s always been about You…’, we are gently reminded that Jesus is the only One who matters, as we draw deeper into communion and a relationship with Him. “Magnify”, an old school Audio Adrenaline or dc Talk rocker driven by bass and heavy electric guitars, and “Home”, the mid tempo ‘coming of age’ song driven by light guitar, delving into the concept of searching for home and where it exactly it is; also resound greatly with me. While the former song paraphrases Isaiah 60 in the verses, and crescendos to an all-out praise anthem declaring ‘…magnify the Lord together, exalt His name forever…’ (also subduing to a quiet reflective piano led track in the bridge); the latter, building to a majestic feel-good inspirational track, has a bit of Switchfoot and The Afters musically and vocally in it, as listeners are reminded, with the song sung from God’s point of view, that home is wherever He is, and where our loved ones as well. Again ambiguous on overtly preaching the gospel, as Fellowship Creative have stressed that we can ‘…get your head up, the search is over, the path is lit up, so come on over, you’re always welcome here, this is love, this is life…this is home…’; all I can say is mainstream radio is beckoning, and with a song about finding out where we belong and our purpose in life, the band should be very proud of this gem! Just as the band can record brilliant horizontal themed songs, their vertical worship themed tracks are equally as enthralling and captivating. There’s a vivid description of the crucifixion and resurrection across poignant glockenspiel and stirring keys, culminating in a choir and orchestral final chorus highlighting that ‘…great is Your glory, great is Your love for us, let my heart be Your throne, Jesus My King…’, in the Hillsong like “Jesus My King”, and also the topic of gratitude and surrendering everything to the One who loves us unconditionally is explored, as ‘…Jesus I am desperate for You…’, shown through the Sanctus Real and Stellar Kart vocally influenced and piano led ballad “Desperate For You”, written after the death of one of the leaders’ father. Singing about and authoritatively declaring that Jesus is the only One we need, passionately asserting that He is our refuge, and that we don’t need anything or anyone else except for God; the pop rock electric guitar led song “The One I Need” has vocals eerily sounding like Jon Micah Sumrall from Kutless. Is he a guest vocalist? I wouldn’t be surprised! While the electronic and dance themed prophetic offering of praise and worship song “God Of My Rescue” has the band admitting that Jesus is our rescue, that all things are possible with Him, birthed out from staff members experiencing miscarriages; it’s almost certain that these songs that Fellowship Creative have unveiled to us will stand the test of time and be introduced in churches everywhere. With the catchy and joyful LZ7/TobyMac/KJ52 rap influenced “Future Back” being another of my favourites, I find that the ingenious animated music video with tons of extras, and the fact that it also has a myriad and wide range of genres attached to it, as there is pop, rock, jazz, rap, dance, a bit of folk, all wrapped up in a 240 second semi-jingle, enhances my enjoyability of the song and the message of celebrating the new life found in Christ and giving gratitude to God for the days ahead, becomes all the more appealing. The quiet, contemplative, acoustic guitar led album closer “Beautiful”, sung to God, focusing on His splendour and sovereignty, tries to reconcile the fact that God is all knowing and all loving yet bad things happen to good people. With the end result of the track, inspired by Bethany Hamilton’s testimony of losing her arm and how her faith was strengthened; being a string of prophetic moments and iterations that boggle the mind and are sure to reassure even the most doubting of doubters; it is the tracks “Never Be Without It” and “The Everlasting” that move me the most on this album. Maybe it’s because of the refreshing change in singer, from a male to a female, or maybe because these couple of tracks remind me of Warr Acres’ latest songs, but nevertheless these two tracks are Holy Spirit anointed. As the upbeat electronic gem sings out that ‘…Your love, I’ll never be without…I’ll never have to doubt it…’, a smile comes to my face as I praise God and my Saviour for His endless love and faithfulness, the fact that He always keeps His promises and that we are forgiven. And one of the last songs on the album, “The Everlasting”, a hopeful and motivational synth led ballad, a sublime and fitting way to end the album, is available in its acoustic version on the deluxe edition as well, containing some strong lyrics rooted in the Psalms. As the chorus speaks out about God being the everlasting, the One who is and is to come, I am amazed at the sheer brilliance of Fellowship Creative in this thoughtful, moving and lyrically sound debut album. It’s come at me at left field, and surely will stay in my top 10 albums of the year! As we sing out loud God’s promises and praises, Fellowship Creative have created so many worthy worship songs that I am sure that we can sing them again and again and still be equally as challenged and impacted. With such variety musically, vocally and lyrically (how many vocalists are present here? I’m not entirely sure but there are a lot, and they are talented! ), Fellowship Creative have recorded a fantastic label debut (inclusive of a bonus track, the electronic guitar led rock anthem “The Takeover”, asserting that God is taking over the world, and is alive is each one of us, as we live out our lives and glorify Him). While their anonymity in personnel and members, as they have a revolving door of musicians, staff and singers attached to this project and previous independent albums, could mean that the band doesn’t individually receive recognition for their God breathed anthems that they so deserve; this notion of not knowing the band members has led me to listen to the song lyrics a bit more and soak in the presence of God, something which was probably one of the intended goals of Fellowship Creative. And though it may seem that this church is jumping on the bandwagon at first impression on releasing a worship album because they can, I truly believe that these songs are sure to speak to you and be common on iTunes playlists in many households, and on set lists in many churches as well; that this is a very special album, it certainly has taken me by surprise and that’s definitely a good thing! Well done Fellowship Creative for setting the bar high, let’s hope they can match it on their sophomore album, or even beat it!